In its native Indonesia, satay is a masterpiece of culinary variety, a simple concept expanded to embrace any kind of meat you can fit on a stick. There’s steak, pork, and chicken – but there’s also liver, tripe, quail eggs, eel, and rabbit, all of it marinated, grilled on a skewer, and topped with a spicy sauce. You can find satay everywhere from street stalls to fancy restaurants: it’s a very basic technique expanded into a national art form with a variation to suit every taste. To make this Paleo version, I’ve substituted almond butter for the typical peanut-based sauce, but kept the sharp flavors of lemongrass, ginger, and chilies, and the underlying tang of the fish sauce. You can serve it with or without the almond-butter sauce; if you’re not quite sure how much spice you’re ready to go for, why not serve the sauce in a separate dish so each person at the table can choose how much they want? 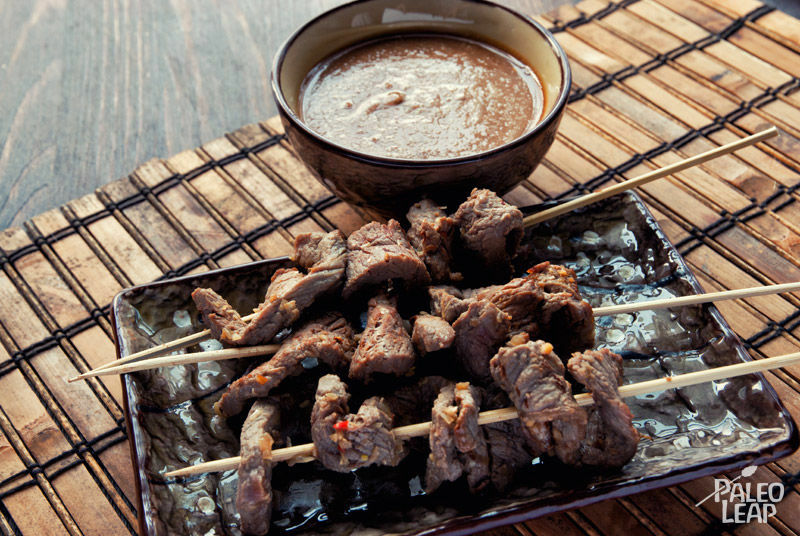 To serve the satay, you can cook the beef either on or off the skewer, but they’re easier to serve and eat on a stick. This recipe would make a great game night dinner or finger food for a party, since the sticks are easy to eat with minimal utensils and without making a mess. Kids also love eating anything off a skewer, and you can tone down the spice for younger palates just by leaving the chilies out of the marinade. It’s a little more sophisticated then BBQ wings, but still a finger-licking treat that doesn’t take a lot of fussing: add some chopped vegetables and dip as a side dish, and watch the sports fans and the foodies find something they can all agree on. SERVES: 4 PREP: 15 min. + 1h COOK: 10 min. 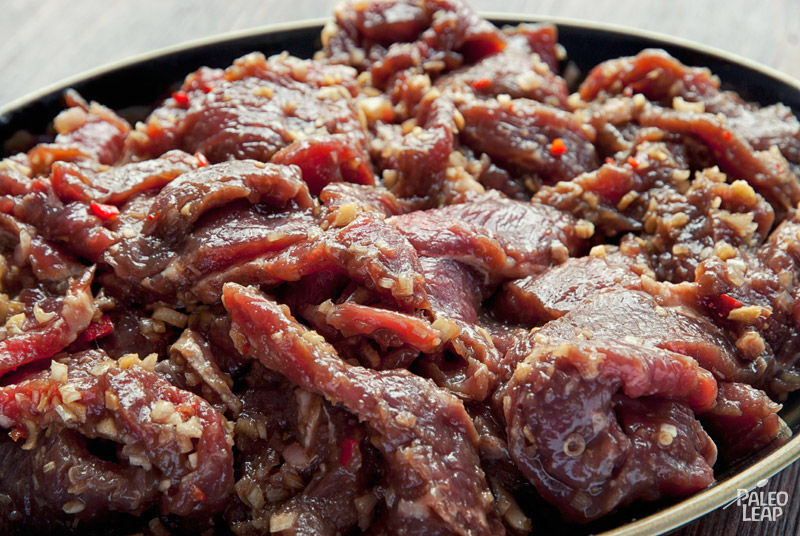 In a large bowl, combine the beef with all the ingredients for the beef satay. Stir everything together and let it marinate for at least an hour. In a skillet placed over a medium heat, melt some cooking fat or ghee. Add the shallot, ginger, and lemongrass, and cook until golden. Add the coconut milk and the coconut aminos and bring to a boil. Add the almond butter and the sambal sauce, season to taste, and remove from the heat. Remove the beef from the marinade. If you’re using skewers, load them up now (the traditional serving is 4 pieces per skewer). Cook the meat on a grill that’s been preheated to medium-high 2 to 3 minutes on each side. Serve warm with the almond butter sauce.